Farmington City Hall is located at 23600 Liberty Street, Farmington, MI 48335; phone: 248-474-5500. Photo: Botsford Inn, ca. 1836, 28000 Grand River Avenue, Farmington, MI. The Inn was built as a home by Orrin Weston in 1836; it was converted into a tavern by Stephen Jennings in 1841 known then as the Sixteen Mile House. Milton Botsford acquired the Inn in 1860. Listed on the National Register of Historic Places in 1979. Photographed by User:Andrew Jameson (own work), 2010, [cc-by-3.0 (creativecommons.org/licenses/by/3.0)], via Wikimedia Commons, accessed June, 2015. 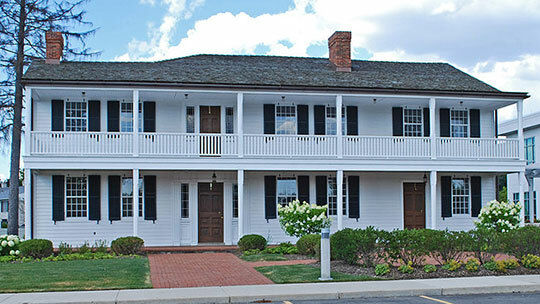 Farmington's character is rooted in a long history as one of the oldest communities in Oakland County. The area was first settled in 1824 by Arthur Power, a Quaker from Farmington, New York. Soon after, in 1825, Dr. Ezekiel Webb established the first Post Office and became Farmington's first postmaster and physician. The first school was established several years later in 1828. During the time of slavery, Farmington served as a station on the Underground Railroad. In 1827, Farmington Township was established by the Legislative Council of the Michigan Territory. Farmington was officially incorporated as a village in 1867. Town meetings were held in a variety of locations until the completion of the Town Hall (now the Masonic Temple) in 1876. Farmington became a home rule city in 1926. Farmington was the home of Michigan's 26th Governor, Fred Warner, who served from 1905 to 1911. The Warner Mansion, located on Grand River Avenue, is now a museum maintained by the Farmington Historical Commission. Until the 1950's, Farmington was considered a small village that primarily served the area's farming community. However, during the post-war building boom, suburbanites began to move out from Detroit, transforming Farmington into a suburban area. During the late 1960's, the City annexed 500 acres, which extended the western boundary of the City to Halsted Road. Further expansion of the City's boundaries was limited when the surrounding Farmington Township was incorporated as the City of Farmington Hills in 1973. Farmington's long history can still be seen in the historic buildings downtown and in the surrounding neighborhoods, which make up an essential part of the community character and give the City a strong sense of place. City of Farmington, Oakland County, Michigan, Master Plan, 2009, www.ci.farmington.mi.us, accessed June, 2015.